It’s not often I get to tell an author in person how much her work means to me. I had the opportunity to do this recently when I went to Pittsburgh Arts & Lectures Kids and Teens with my son to see Cece Bell. 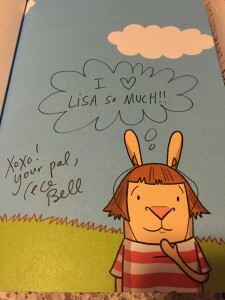 Cece is an author and illustrator currently on tour for her graphic memoir El Deafo. 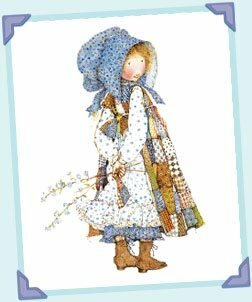 Among the many accolades it has received, it was listed as one of the the NYT Notable Children’s Books of 2014, NYT Notable Middle Grade Books of 2014, and is a 2015 Newbury Honor book. What’s great about all of this attention is that this book has entered the public consciousness. When my parents gave it to me soon after its release, I hadn’t heard of it. I actually kept it on the shelf for a long time, assuming it was about a deaf person who used sign language to communicate. 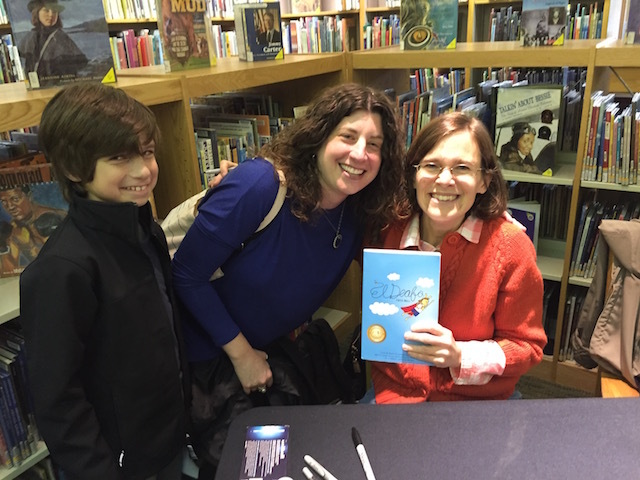 Every time my parents visited, my mom would ask, “Have you read El Deafo yet?” When I finally admitted my reason for procrastinating, she told me it was actually about a deaf person who spoke and read lips. Well, then! I’m glad Cece learned how to share her superpowers and be comfortable with them, but I couldn’t help but cringe a little at how her classmates “used” her. The note from the author at the end is also on point. I made my kids read the book too, because I wanted them to get a better sense of my childhood. Cece’s book illustrates in wonderful detail what it was like to lose her hearing from meningitis at the age of four, and follows her ups and downs through elementary school. The note from the author at the end that I referenced? Cece writes about differences in deafness – the cause and level of deafness vary, and so does communication. She talks about the Deaf community, or Deaf Culture, where sign language is the main mode of communication and deafness is viewed as a condition that shouldn’t be fixed. Deafness is considered their main identity, whereas for people like me and Cece, it’s just one part of who we are. In her note, Cece emphasizes that her experience is hers alone. This is why I was surprised when she shared a different point of view in her talk. She said the school she attended — which had other deaf children — believed in only teaching them how to speak and lipread. They felt if sign language was taught, it would be a crutch. Cece said she doesn’t agree with this now, and wishes she had learned sign language. 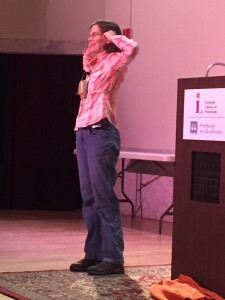 During the Q&A phase, someone asked what the Deaf Culture reaction was to her book. She admitted that she was scared for the potential fallout. Maybe she made this comment about sign language to appease those folks, but I wish she had tempered it a bit. Especially since research shows that the mostly signing “total communication” approach just isn’t as successful as other modalities. Otherwise, Cece’s talk was great. She had the audience laughing throughout. She started off with an experiment. When her back was turned, we all yelled HELLO! as loud as we could at the count of three. With her hearing aids on, she heard us. Then we did it again, with her hearing aids off. Naturally, she couldn’t hear us. I think a better experiment would have been to have some volunteers play the game of Telephone to demonstrate how difficult lipreading can be. I got to see my nemesis, the Phonic Ear, again as Cece actually had hers from childhood. She put it on to show how bulky and embarrassing it was to wear. Cece was asked why she wrote her memoir in graphic novel form. She said it was the perfect medium to tell her story because of the speech balloon, which allowed her to visually show what life can be like for a deaf person. An empty speech balloon, for example, shows that little Cece isn’t hearing anything. A panel with the audiologist has him saying, “RAAY YOE HANN WAH OO EER AAH BEEP!” And one of my favorites is the panel in which he adjusts the dial on her FM system and the text shows the volume increasing by going from light to bold. An audience member asked why Cece used bunnies instead of people. She explained that it’s a great visual metaphor for hearing loss: ears that stand out, especially with the cords and ear molds going into them. Teachers often forgot to turn their microphones off, so Cece was able to hear them in other parts of the building, like the bathroom. Because of this, she began to think of her deafness as giving her superpowers. Interestingly, Cece wasn’t comfortable with her deafness until recently; she didn’t like to advocate for herself. 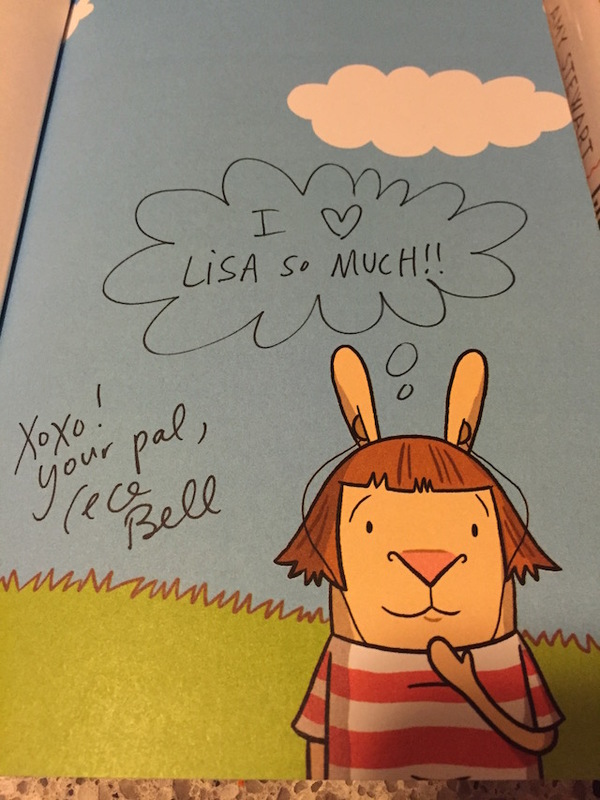 But an incident at her local Kroger turned things around and started her on the path to writing El Deafo. A boy in the audience asked if she planned to write a sequel (stealing my question!). She said she has lots of ideas but hasn’t done anything yet. After the talk, we waited in line for a long time to get her autograph, but it was worth it. I told her that I was born three years after her in the 70s, and that her book was meaningful because it mirrored a lot of my own experience. Gesturing to my son, I said that it was great having my kids read it to gain a better understanding of my childhood. She asked what I wear, and I told her a cochlear implant and hearing aid. I alluded to the fact that she’d benefit more from a CI than me, because (unlike me) she was post-lingually deafened. I also encouraged her to write a sequel. 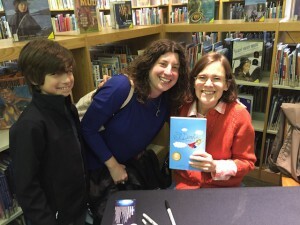 Every stage of life brings different challenges, and I’d love for El Deafo to continue to educate and entertain. I’m a writer, but not an illustrator. Cece is both, and I thank her for bringing our shared experiences to life in a way that I never could. Would you like some angst with that? Ordering at a drive-thru is something many people take for granted. But a viral video shows the simple act of ordering a mocha frappuccino from Starbucks made possible because of technology. With over 6 million hits, people are realizing that drive-thrus — which were created to help with efficiency and convenience — are the opposite for people with hearing loss. “I never thought about the fact that you can’t order at a typical drive-thru because you can’t hear what they’re asking, even though they could hear you!! !” wrote a friend in an email. But let’s face it – drive-thrus are the ultimate in laziness. Sometimes it even takes longer to order at the drive-thru than it does to get out of the car and walk inside. When my kids were younger, it was a dilemma: Do I wake up a sleeping child or take a child out of the PIA carseat or deal with the hassle of the drive-thru? If the weather is bad, drive-thrus are definitely appealing. And since they exist, it’d be nice to at least have the option to use them. Starbucks announced in mid-October that they were adding video screens to 2,400 cafes with drive-thrus. It’s not clear how many locations have this currently in place. The St. Augustine, Fla. Starbucks that King frequents is located near a school for the deaf and blind, so it has worked to accommodate those customers. Four of that location’s baristas know ASL. This scenario just isn’t possible in the real world. This is another reason why I’m glad that my parents decided that my sister and I would learn how to lipread and speak. I can still benefit from video screen technology even though I don’t sign, because it would allow me to lipread. Drive-thru employees always have a video screen at their end, so theoretically, it should be easy to make it two-way. For those (many) locations that won’t have employees who know sign language, perhaps a texting/typing option could be added – either by using a pull-out keyboard, or better yet, our own phones. Wouldn’t that be a great app? Anyone? Bueller? In the meantime, I hope other companies take note. After all, improving accessibility will only increase profits. Starbucks certainly has the money to implement this technology, so the cost is likely negligible compared to the eventual payout. Can I order a video screen, please?